Below we will look, briefly, at his terrorist career of the German terrorist Johannes Weinrichand his relationship to the terrorist known as Carlos the Jackal. Johannes Weinrich was born in Brakel, Germany on July 21, 1947. His initiation into the world of terrorism began in Frankfurt within a circle of left-wing radicals that that congregated around the “Red Star” bookstore and publishing house. 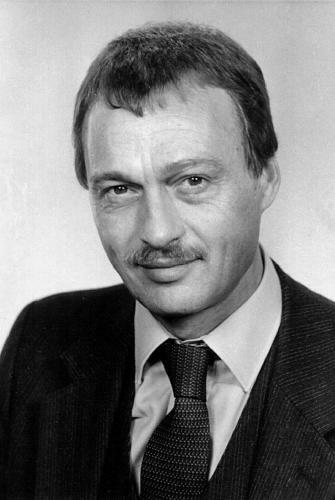 In the early 1970s, Weinrich was known for his role in initiating anti-Vietnam demonstrations for being part of the founding member of the Solidarity Committee with the Black Panther movement in the United States. Over the years the media has misidentified Weinrich as being part of the core of the German terrorism group Red Army Faction. This is not so: he was part of another German terrorist group Revolutionary Cells (Revolutionäre Zelle — RZ. In Frankfurt, Weinrich then met Magdalena Kopp–the future girlfriend and later wife of Carlos. Weinrich left Frankfurt and opened his own bookstore near the university in Bochum, Germany, where he stayed for a few years. It is not yet clear how and when Weinrich first met Carlos. His first act of international terrorism was in January 1975 when he rented and drove a Peugeot automobile using the name Fritz Mueller. This car was used in Carlos unsuccessful rocket attack on the Israeli El Al airliner at Orly airport outside Paris. Two months later Weinrich was arrested in Frankfurt, Germany for his participation in the rocket attack. Red Army Faction (RAF) terrorists forcibly occupied the West German embassy in Stockholm, Sweden, on April 24, 1975, in a failed attempt to free “political prisoners”, i.e. fellow terrorists jailed in West Germany. Weinrich’s name was on the list of terrorists to be freed. In November 1975, Weinrich’s health had deteriorated, and he was released from prison on bond to his family–Magdalena Kopp contributed one third of the money for the bond. 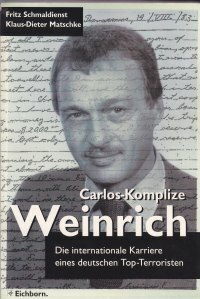 Weinrich left West Germany and by 1977 he was a core member of Carlos’ group then called the Organization of the Armed Arab Struggle–Arm of the Arab Revolution. 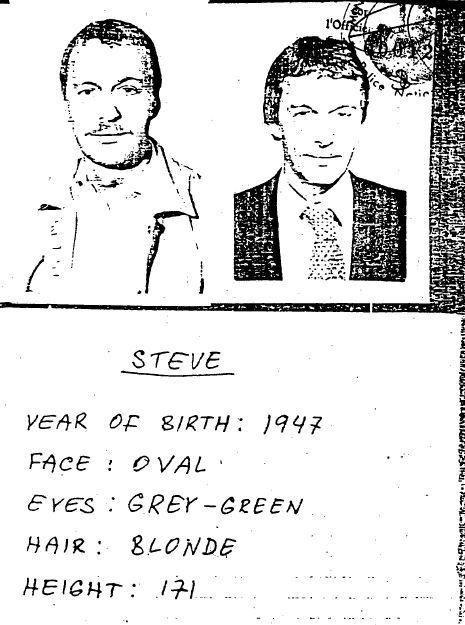 By 1979, Weinrich, as “Steve,” was the right-hand man of Carlos and reportedly was responsible for the estimated 40 European members of the OAAS and for liaison with various East European and Cuban intelligence officers. Stasi files made available after the collapse of Communism in East Germany contain this February 1981 show the close relationship between Carlos and Weinrich: “Weinrich is a former member of the Revolutionary Cells in the Federal Republic of Germany, and his responsibility in Carlos’ group is to direct the group’s activities in Europe. He is one of the people who can partly influence Carlos. After the bombing of RFE/RL, the Carlos group had financial problems. Weinrich told Carlos in one letter that his financial situation was so critical that he seriously considered asking his parents in Germany for a loan of 50.000 to 100,000 DM. On May 31, 1983, Weinrich flew from Bucharest to East Berlin using a Syrian diplomatic pass with the name Heinrich Schneider. Reportedly, his baggage was searched and 24.3 kilograms (50 pounds) of the Romanian plastic explosive Netropinta were found. A computer check of Weinrich showed his connection to the Carlos group. A Stasi officer came to the airport and released Weinrich, but not the explosives. For the next weeks, Weinrich unsuccessfully tried to get Stasi to release the explosives. He stayed at the Intercontinental Hotel in East Berlin until June 10, 1983, when he flew back to Bucharest; it is not know when he returned to East Berlin. osives were released to Weinrich on August 16, 1983. He in turn gave them to Nabil Shritah (Charitah), the Third Secretary of the Syrian Embassy for safekeeping. A week later, Weinrich went to the Embassy and retrieved the explosives. The explosives were then carried to West Berlin in a car driven by Abul Hakam, the Arab-nations contact man of Carlos’ Group. In West Berlin, he met a Lebanese member Carlos Group named Ahmad el-Sibai. El-Sibai placed the explosive in a building next to the French Cultural Center (Maison de France) and on August 25, 1983, at 11:50 AM, the bomb went off. Damage was estimated to be in excess of 2.5 million DM, one person was killed and over 20 were injured. Abul Hakam flew to Budapest and El-Sibai flew to Damascus the next day. First of all I want to inform you of the latest news: today I phoned Lybia, spoke to Salem, when I told him that I wanted to travel there, he told me that on monday he is traveling to Damascus and that we can meet here. I will use the French intervention in Chad as a pretext to restart cooperation. I have not waitied any longer because all my money is finished with Feisals’s trip (he takes $2000 for you and $500 reserve).There is left only the $15,000 dollars reserve. Get from Bucharest all the papers and photgraphs regarding the old Jewish woman in Rome whom you phoned once. I think we should engage ourselves in this affair next month after her return from holidays. Convince Tina and Kai to prepare it and if possible to execute it. If needed, either Feisal or Farig will go as well. Please remember that this is a one million dollars business! Tina was the code name for Wihelmine Götting — she was also known as Julia, Lina and Martine. Kai was Gerd Albartus. Both had belonged to the German terrorist group Revolutionary Cells. Reportedly, Albartus wanted out of the group and in December 1987 he flew to Damascus, where he was put on trial as a “traitor” by Carlos and the group, sentenced to death and killed. Weinrich remained in East Berlin for one day and then flew to Belgrade, Yugoslavia. While there he wrote a 27-page letter using the name Peter on August 29, 1983, in English to Carlos (using the name Michel). Regarding Helmet, it is clear that we could trick them, mainly on behalf solidarious help given by Nabil. By the way: he knows about the Operation but as he told and suggested me, not officially … Because he gave me the hand in keeping explosives without informing the Ambassador, who was absent, but came back before the Operation. So officially Nabil doesn’t know about the Operation, only the fact that I brought a bag and took it later. Helmet was always warning us, not to have an operation in West going directly from East and returning. We always denied and kept the cover of only transporting the bag to the West. They seemed to me on Friday — last meeting with them — not to be sure, if we have done it or the ASALA. And I kept the story: telling them in a way that ASALA never claimed an operation, if not carried out by them. And a big kiss for you. ASALA was the terrorist group Armenian Secret Army for the Liberation of Armenia. In the 1990s, according to reliable sources, Weinrich proudly drove a Mercedes in Damascus and had it repaired regularly at the Mercedes dealership. He regularly attended parties given by prominent German citizens in Damascus. Johannes Weinrich was arrested in a suburb of Aden, Yemen and extradited in June 1995 to Germany. Even the details of Weinrich’s arrest were shrouded in a “myth.” One Yemeni official said he had been arrested “several months after the end of the civil war in Yemen in July 1994.” He was using a Somali passport identifying him as John Saleh. He also had a passport in the name Peter Smith. German authorities, on the other hand, said he had been arrested on June 1, 1995, after a long German-led investigation. The trial of Johannes Weinrich began in Berlin Wednesday, February 28, 1996 for the bombing of the French Cultural Center in Berlin. He was found guilty and sentenced to life imprisonment for the attack on the French Cultural Center. In March 2003, the trial of Johannes Weinrich for his role in the bombing of RFE/RL began in Berlin. Magdalena Kopp, called as a state witness, refused to testify. However, in her various sworn statements to German prosecutors before the trial, she clearly identified Romanian intelligence involvement in the bombing of RFE/RL and confirmed that Carlos was praised in Bucharest after the bombing. She said that she was given the task of going to Bucharest in January 1980 to set up the relationship between the Romanian “secret police” and Carlos. She added that the Group received weapons and explosives, part of which went to the ETA. Because of her apparent cooperation with the German Prosecutor’s Office, her legal status changed from “suspect” to “witness” in the bombing of RFE/RL. The presiding judge decided not to continue the trial for the bombing as Weinrich was already serving a life sentence. Appendix D of my book Cold War Radio has the full text of the August 19, 1983, Carlos letter to Weinrich and Appendix F is the full text of the August 29, 1983, letter from Weinrich to Carlos. In Preparing for the Munich Tango, we read about Johannes Weinrich and Bruno Breguet and their involvement in the “Carlos” bombing of Radio Free Europe/Radio Liberty on February 21, 1981. I already outlined the terrorist career of Johannes Weinrich; below we will briefly look at that of Bruno Brequet. Bruno Breguet was born on May 29, 1950, in Coffrane, Switzerland. In 1970, when he was 19 years old, Israeli authorities arrested Breguet as he attempted to smuggle two kilograms of explosives into that country from Lebanon. His aim was to blow up a high-rise building in Tel Aviv on behalf of the Popular Front for the Liberation of Palestine (PFLP). He was sentenced to 15 years imprisonment but was pardoned in 1977 and released from prison. He returned to Switzerland and, apparently, joined the Swiss terrorist group “Prima Linea.” Breguet wrote a book La scuola dell’odio (The School of Hate) that was published in 1980 in Milan, Italy. Bruno Breguet joined the “Carlos” terrorist group in September 1980 in Budapest, Hungary, and was given the code-name “Luca.” In the night from September 24th to 25th, he attended a planning session to bomb RFE/RL. This is his first known activity with the “Carlos” Group. He became a “bomb expert” for the group. Almost one year to the day after the bombing of RFE/RL, Magdalena Kopp (“Lilly”) and Bruno Breguet (“Luca”) were arrested in Paris on February 16, 1982, while preparing another “Tango”, a car bombing of the building, where the office of the Lebanese magazine Al Watan Al- Arabi was located. Breguet had arrived in Paris on January 2, 1982 to conduct surveillance of the magazine office and editors. Kopp had flown on February 6, 1982, to Paris from Bucharest with a false Austrian passport and driver’s license produced by the Romanian intelligence service in the name Doris Berger. The Basque terrorist group ETA provided a white, Peugeot 504 automobile with explosives in the trunk, which she was to drive to the targeted building. She received the keys from the Belgian-born ETA terrorist Luc Edgar Groven (“Eric”); Breguet was to detonate the explosives. Kopp and Breguet were arrested on February 16, 1982, outside a parking garage on the Champs Elysees after being confronted by security guards, who had challenged them as to what they were doing in the garage–she had difficulty opening the car and they could not produce a parking ticket. Brequet reportedly pointed a pistol at the guards. He and Kopp then ran from the garage but were immediately arrested by French police outside — Brequet aimed the pistol at a policeman, pulled the trigger but it jammed and he was subdued. In the car, police found a map of Paris, a Belgian-made GP35 pistol, 2 kilos of Pentrite explosives, two Czechoslovak hand grenades, an alarm clock set for 10:30 PM that night and a battery complete with electrical wiring. According to later testimony of Magdalena Kopp, the magazine’s office was to be bombed on a “contract” to “Carlos” from the Syrian government because of its previous anti-Syrian articles. In fact, on December 19, 1981, police were able to diffuse a dynamite explosive one minute before it was due to explode just outside the magazine’s office. The Syrian Embassy in Paris was traced to that bombing attempt. “Carlos” visited Damascus in December and apparently then was given the contract to bomb the magazine’s office. “Carlos” in Budapest threatened the French government with retaliation, if the two were not released within 30 days. He signed the threatening letter “Carlos – Organization of Arab armed struggle – Arm of the Arab Revolution” and to prove his identity, he provided samples of his thumbprints. sque terrorist group ETA. Five persons died and 30 were injured. Then French President Jacques Chiriac was scheduled to ride on that train but had canceled his reservations shortly before the train’s departure. On April 21, 1982, another bomb exploded outside the French embassy in Vienna, killing an Austrian policeman who was guarding the building. Although there was the unsuccessful bomb attack in February, on April 22, 1982, the day the trial of Kopp and Breguet began in Paris, a car bomb exploded in front of office building, where the magazine Al Watan Al- Arabi was located, killing one and wounding over 60 other persons–10 seriously. The car was an orange-colored Opel Kadett with Austrian license plates. French investigators believed that German terrorist Christa-Margot Froehlich (“Heidi” in the Carlos group) rented and drove the car from Ljubljana, then Yugoslavia. Investigators also believed that she handed the car over to Johannes Weinrich, who then drove the car to the building housing the Al Watan Al- Arab magazine office. Froehlich had joined the Carlos group in 1981 from the German terrorist group “Revolutionary Cells”–apparently recruited by Weinrich. She was later arrested by Italian police at Rome’s airport on June 16, 1982. Froelich was traveling from Bucharest, Romania, under a false German passport and carrying a specially adapted suitcase that contained over three kilos of explosives, detonators and an alarm clock. She was later convicted and sentenced to six years imprisonment. Bruno Breguet were released from French prison on September 17, 1985, and returned to Switzerland. Reportedly, after his release Breguet gave up his terrorist career, yet in 1987/1988, Breguet reportedly was in meetings with the “Carlos Group” in Damascus, Syria. In any event, there are no reports that he was actively involved in any terrorist activity afterwards. On November 11, 1995, after traveling from Greece to Italy on the ferryboat “Lato”, Italian authorities refused Breguet entry and returned him on the same ship. Since then, Bruno Breguet has not been seen in public again. He was 45 years old. The myth about Bruno Breguet continued when one story surfaced in late 1996 that Breguet was in French custody in Budapest, Hungary. He was being confronted with witnesses and documents, particularly concerning the implication of high French authorities in arms traffic to Algeria. This traffic supposedly involved high French ministerial officials and also high regional officials in Nice. Reportedly, French DST (counter-espionage) found him in Croatia and passed the information to the DGSE (foreign intelligence service) that sent member of its Special Forces to capture Breguet and take him to Budapest. Breguet reportedly cooperated with French intelligence and justice officials. Mister President, Your decision to close secret C.I.A. jails, honours you. Our Comrade Bruno Breguet, a Swiss citizen, was abducted on 11th November 1995 from a ferryboat between Italy and Greece, in a special operation with NATO naval support. We pray you to have Bruno released. We were informed unofficially, that Bruno died accidentally during interrogation at a U.S. base in the south of Hungary. If Bruno truly is dead, we need his body back, so his relatives, friends, and comrades, may mourn in neutral Switzerland, this hero of the Palestinian Cause, and his eternal soul join our martyrs in heaven. Do not hesitate to have your services contact my Swiss attorney Marcel Bosonnet, and the coordinator of my defence team, and dearest wife, Maître Isabelle Coutant (Peyre), of the Paris Bar. To erase the infamy attached to Guantanamo base, do return that occupied territory to its rightful owners, the Cuban people, on this 50th anniversary of their revolution. From Anonymous: Luc Edgar Groven (“Eric) died in Bilbao, Spain, in August 2011. Im heutigen durch den Geist des Dhimmitums bestimmten Europa – der Umstände der Unterwerfung der Juden und der Christen unter die Vorherrschaft des Islam – kämpft man nicht, weil man sich schon kampflos ergeben hat. Diese Verkettung, die aus Europa den neuen Kontinent des Dhimmitums macht, ist seit dreißig Jahren auf Anstiftung von Frankreich in Gang. Eine anspruchsvolle Politik hat sich also abgezeichnet, die Symbiose Europas mit den arabisch-islamischen Staaten, eine Symbiose, die Europa – und vor allem Frankreich, treibende Kraft des Projektes – Gewicht und Ansehen gäben, mit dem der USA zu rivalisieren. Diese Politik wurde diskret betrieben, außerhalb der offiziellen Verträge, unter dem harmlosen Namen Euro-arabischer Dialog. 1974 wurde in Paris eine unter der Schirmherrschaft der europäischen Staatschefs und ihrer Außenminister in direkter Verbindung mit ihren arabischen Kollegen sowie mit den Vertretern der Europäischen Kommission und der Arabischen Liga wirkende Vereinigung von Parlamentariern der EWG gebildet, die Association Parlementaire pour la Coopération Euro-Arabe, und mit der Gestaltung der finanziellen, politischen, wirtschaftlichen, kulturellen und Migrationsaspekte der euro-arabischen Beziehungen betraut. Diese Strategie, deren Ziel die Schaffung einer euro-arabischen Mittelmeergruppierung mit freier Zirkulation von Waren und Personen war, hat die arabische Einwanderungspolitik in die EU bestimmt. Sie hat seit dreißig Jahren auch die gesamte kulturelle Politik in den Schulen und Universitäten der Gemeinschaft bestimmt. Seit der ersten Sitzung der Minister und europäischen und arabischen Staatschefs und der Arabischen Liga des Euro-arabischen Dialogs, in Kairo 1975, wurden Abmachungen betreffs Verbreitung und Förderung des Islams und der arabischen Sprache und Kultur in Europa durch die Schaffung arabischer Kulturzentren in den europäischen Städten getroffen. Weitere Abmachungen sollten dem folgen, um die euro-arabische Symbiose der Universitäten, Medien, Journalistenverbände, der geschriebenen und audiovisuellen Medien, der Schriftsteller, Verleger, Filmproduzenten und des Technologietransfers – einschließlich des nuklearen -, kurz eine Fusion aller kulturellen und medialen Bereiche sowie die Vorteile einer gemeinsamen Diplomatie auf den internationalen Foren abzusichern. die politische und historische Delegitimation Israels, die Verringerung seines Territoriums in einen nichtlebensfähigen Staat und die Arabisierung Jerusalems. Daher der verborgene europäische Krieg gegen Israel durch Wirtschaftsboykott und, in einigen Fällen an Universitäten, durch Diffamierung und Propagierung von Antizionismus und Antisemitismus. der Unterricht in Arabisch und in arabischer und islamischer Kultur sollte in den Schulen und Universitäten Europas durch arabische nichteuropäische Professoren erteilt werden. Im politischen Bereich hat Europa sein Schicksal an das der arabischen Staaten gebunden, es ist in die Logik des Glaubenskrieges gegen Israel und Amerika eingetreten. Wie kann Europa die Haßkultur des Glaubenskrieges anprangern, die von seinen Verbündeten hervorgebracht wird, wenn es über Jahre alles getan hat, den Glaubenskrieg zu aktivieren, den es deckt und rechtfertigt unter dem Vorwand, dass die Gefahr von denen herrührt, die den arabischen Glaubenskriegern widerstehen, seinen Verbündeten, denen es in den internationalen Gremien und durch seine Medien dient. Im kulturellen Bereich wurde seit den 70er Jahren durch die europäischen Universitäten eine Neuschreibung der Geschichte betrieben. Dieser Prozeß wurde durch den Europarat während seiner Parlamentarischen Versammlung über “den Beitrag der islamischen Zivilisation zur europäischen Kultur”, im September 1991, gebilligt. Er wurde bestärkt durch Präsident Chirac, in seiner Rede vom 8. April 1996, in Kairo, festgeschrieben durch den Präsidenten der Europäischen Kommission Romano Prodi mit der Gründung einer Stiftung zum Dialog der Kulturen und Zivilisationen, die alles verwalten wird, was auf dem neuen Kontinent Eurabia, der ganz Europa und die arabischen Staaten umfaßt, gesagt, geschrieben und gelehrt wird. Das Dhimmitum hat in Europa begonnen mit der Unterwerfung seiner Kultur, seiner Werte, der Zerstörung seiner Geschichte und deren Ersetzung durch die islamische Sicht seiner Geschichte, unterstützt durch den Mythos von Andalusien. Eurabia hat die islamische Konzeption der Geschichte übernommen, wo der Islam eine Kraft der Befreiung und des Friedens und der Glaubenskrieg gerecht ist. Diejenigen sind schuldig, die ihm widerstehen, wie die Israelis und die Amerikaner, nicht diejenigen, die ihn führen. Diese Politik ist es, die uns den Geist des Dhimmitums gebracht hat, uns blind macht, uns den Haß auf unsere eigenen Werte eingibt sowie den Willen, unseren Ursprung und unsere Geschichte zu zerstören. “Der große Schwindel ist, Europa glauben zu lassen, dass es jüdisch-christlicher Tradition ist. Das ist eine absolute Lüge”, hat Tariq Ramadan gesagt. Wir hassen George Bush, weil er das noch glaubt. Wie rückständig sind doch die Amerikaner! Der Geist des Dhimmitums ist nicht nur eine Unterwerfung ohne zu kämpfen, nicht einmal eine Kapitulation. Er ist durch die Eingliederung von Werten, die uns zerstören, auch die Leugnung seiner Unwürdigkeit, er ist das ideologische Söldnertum im Dienste des Glaubenskrieges, der von ihren Händen und mit Demütigung bezahlte Tribut der europäischen Dhimmi-Steuerzahler, um eine trügerische Sicherheit zu erreichen. Es ist der Verrat an den Seinen. Der Dhimmi erhält eine ephemerische und unechte Sicherheit für die dem Unterdrücker durch Dienstbeflissenheit und Schmeichelei geleisteten Dienste. Das ist heute die Situation Europas. Das Dhimmitum ist nicht nur eine Ansammlung von abstrakten in der Scharia festgeschriebenen Gesetzen, sondern auch durch die Dhimmis selbst entwickelte Verhaltensweisen, um sich der Unterdrückung, an die Demütigung und die Unsicherheit anzupassen und sie zu überleben. Das hat eine eigene Mentalität wie auch gesellschaftliche und politische Verhaltensweisen hervorgebracht, die für das Überleben von auf gewisse Weise in ständiger Geiselhaft gehaltenen Bevölkerungen wichtig sind. Die Dhimmis sind minderwertige Wesen, die Demütigung und Agressionen ohne Widerspruch unterliegen. Ihre Angreifer genießen Straffreiheit, die ihnen ihr Haß gewährt, ihr Gefühl der Überlegenheit und der Schutz durch das Gesetz. Die Kultur des Dhimmitums, das sich in Europa ausbreitet, ist die des Hasses, der Straffreiheit für Verbrechen gegen die Nicht-Muslime, eingeführt aus den arabischen Staaten mit dem “Palästinismus”, der neuen auf das Niveau eines Kultes erhobenen europäsichen Unter-Kultur, Standarte des begeisternden Kampfes der Europäischen Union gegen Israel. In München (1938) hat Frankreich nicht auf seine Kultur verzichtet, auf seine Geschichte, es hat sich nicht germanisiert, es hat nicht proklamiert, dass die Quelle seiner Kultur die germanische Zivilisation wäre. Der Geist des Dhimmitums, der heute Europa verdunkelt, kommt nicht aus einer aufgezwungenen Situation, sondern aus einer freiwilligen Entscheidung und deren seit dreißig Jahren währenden politischen Durchführung. Der große Islamwissenschaftler und Islamfreund William Montgomery Watt beschrieb in seinem Buch “The Majesty that was Islam” (1974) das Verschwinden der christlichen Welt in den arabisierten Ländern so: “Es hatte nichts Tragisches, das war ein sanfter Tod, auf kleinem Feuer.” Natürlich irrte sich Montgomery Watt, es war eine extrem tragische Agonie, von der noch im 20. Jahrhundert die Genozide der Armenier, der Widerstand der Christen im Libanon, in den Jahren 1970 bis 1980, und seit einigen Jahrzehnten der Genozid im Sudan und der israelisch-arabische Konflikt zeugen, der nur eines der Elemente des Jahrtausendkampfes der freiheitsliebenden Völker gegen das Dhimmitum ist, der Würde des Menschen gegen die Sklaverei der Unterdrückung und des Hasses. Aber diese Beobachtung von Montgomery Watt trifft heute vollkommen auf Europa zu. L´Esprit d´Eurabia, par Bat Ye´or.